UPDATE 01/20/11 - Update the board to rev 1.02. Added capacitor to pin 3 of IC1 to slow down the protective function. Removed the un-needed output filter capacitor. UPDATE 11/04/10 - Two important updates as the result of field experience. First, change the value of R1, the gate drive resistor from 10 ohms to 3 ohms. This will prevent spurious oscillations with some brands of IGBTs. Second, change the current sense resistor R2 from 0.015 to 0.020 ohms. This puts the current limit within the capability of the IGBT. The spec sheet calculation didn't quite work out correctly. The power of a Royer oscillator is controlled by the supply voltage, the coupling to the work and the transformer turns ratio. Sometimes it is desirable to vary the power over a wide range for a given work piece. The easiest way to do that is to vary the DC supply voltage. An easy way to do that is a buck converter. A buck converter takes incoming rectified DC and pulse width modulates (PWM) it to control the output DC voltage to a set value. In the design presented here, the venerable TL494 PWM controller is used. It drives an IR2125 high side gate driver which in turn drive an IGBT transistor (a FET could be substituted here but I used the same IGBT as with the heater for economy's sake.) This transistor chops up the incoming DC into pulses which are fed to the smoothing inductor and output filter capacitor. A flywheel diode permits the flow of current through the inductor and to the output when the transistor is off. The converter runs at a fixed frequency of about 80khz. 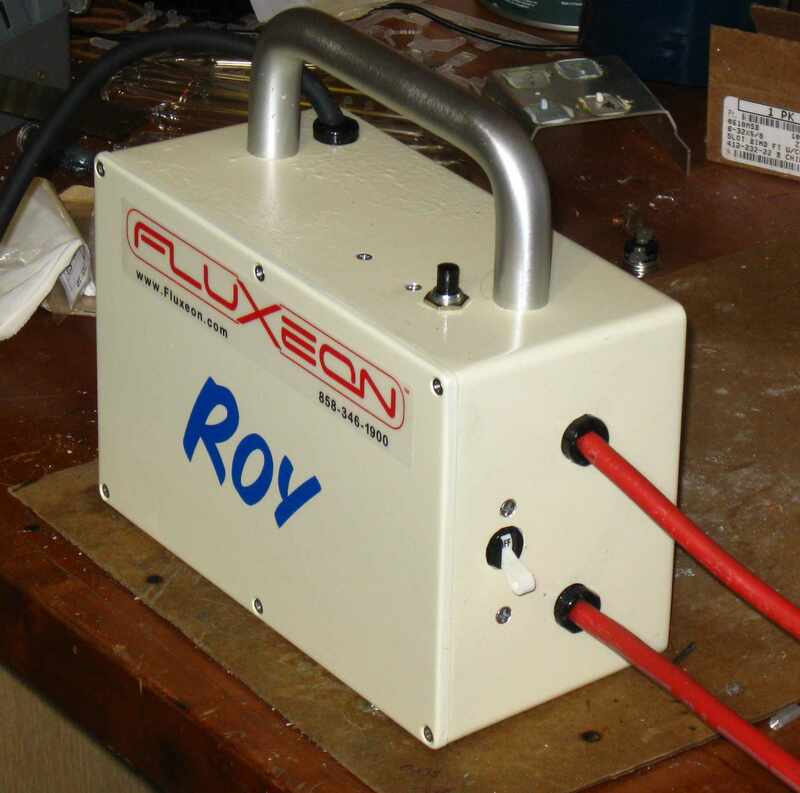 It is designed to use as many parts in common with the Royer heater as possible. A unique feature of this design is the gate drive charge pump that supplies adequate gate drive for even 100% duty cycle operation. The TL494 won't quite go to 100% but it gets very close. This feature lets the range of voltage extend from 0 to about 5 volts less than the input. In addition to controlling the power of a Royer heater, this buck converter can serve as a general purpose non-line-isolated general purpose adjustable DC supply. Charging electric vehicle batteries is one example application. Since the supply can be turned down to 0 volts, it could conceivably be used to charge a single battery. The design goal for this unit is 15 amps output but the components are so over-specified that it can go higher. The ultimate limit will probably be the width of the PCB board traces. These can be reinforced with bus bars if necessary. Also, given the over-specified parts, there is no reason to think that this unit would not work fine on 240 volt input, given the change in filter capacitor voltage rating. Here is the schematic of the converter. It is also downloadable as a PDF and as an EagleCAD file. This drawing is small enough that it will open in the free version of Eagle. UPDATE: Eagle CAD file 1.02. The TL494 PWM controller is at the lower left. It runs at a fixed frequency. It compares the reference voltage at pin 2 with the divided down voltage from the output. It varies the pulse width of the output signal to drive the two voltages together. The output of the TL494 directly drives the IR2125 high side driver. 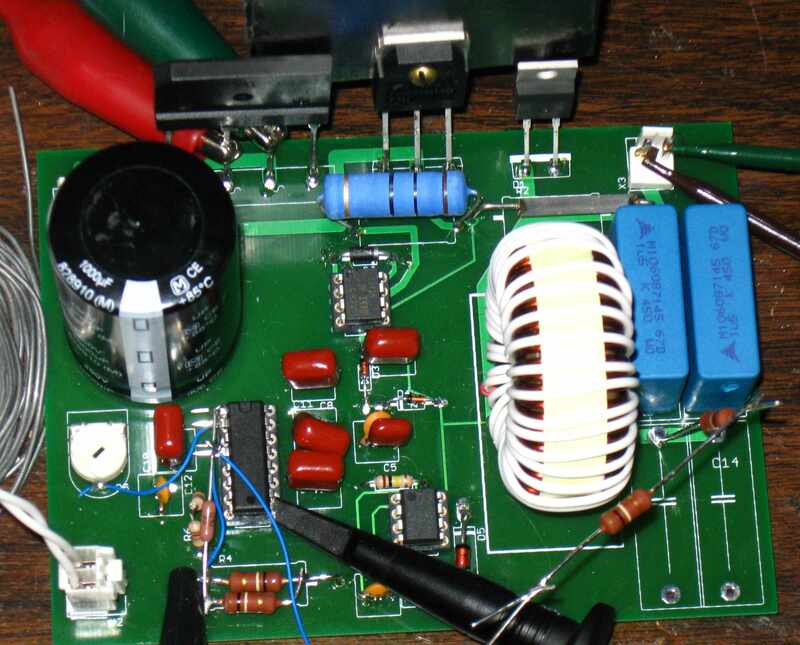 This driver is capable of driving a high side transistor up to 600 volts above ground. It would normally work with the bootstrap diode and capacitor (D2 and C4) to develop the necessary gate drive voltage for the IGBT. However, at very high or very low duty cycles, this simple bootstrap does not work. 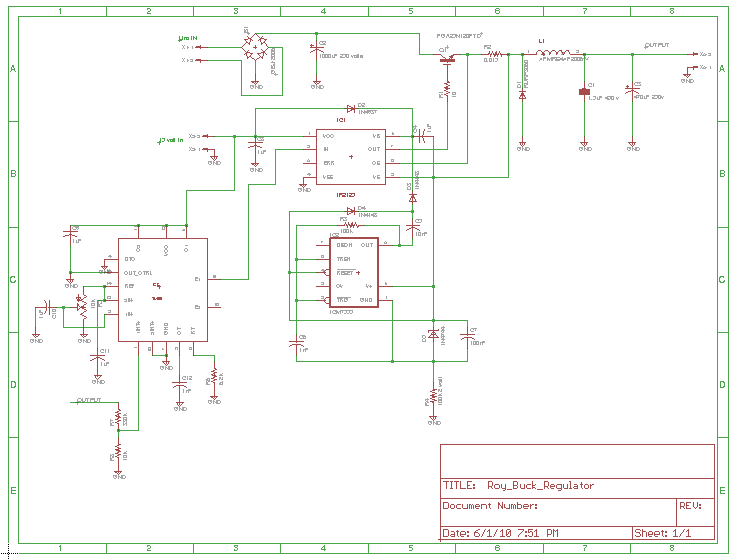 Therefore I have included a charge pump in the form of the CMOS 555 timer/oscillator. This charge pump produces a voltage about 15 volts above the peak DC output voltage. It derives its operating power from the 15 volt Zener diode (D5) and the large dropping resistor (R4). The voltage referenced to ground rises and falls with each cycle of the PWM but the 555's operating voltage stays constant at 15 volts. It sends its approx 10khz output through the charge pump that consists of D3, D4 and C5 to charge the gate drive capacitor, C4. The gate driver IC also has the ability to limit the current through the pass transistor on a cycle by cycle basis. It does so by looking at the voltage developed across the current sensing resistor R2. The speed at which it acts is controlled by the capacitor placed on pin 3. I specified a 0.1uF capacitor as a compromise between speed and noise susceptibility. This value could probably be lowered a bit for faster control. The transistor is heavily over-specified so the over-current protection doesn't have to be too fast. The rest of the circuit is fairly simple. The inductor is charge with energy during the transistor ON period. It discharges through the flywheel diode D1 during the OFF period. The output is equipped with a filter capacitor large enough to maintain stability and low ripple up to at least 15 amps. Here is the PCB. It is approximately half an Eurocard, the default setting in Eagle CAD. This file should open fine in the free version of Eagle. 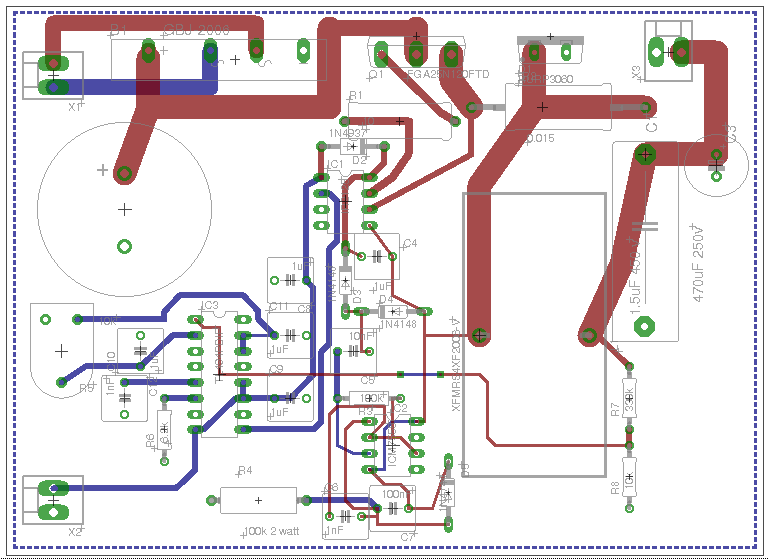 A PDF of the board and the Eagle CAD file are available. Update: Eagle CAD 1.02. I can make Gerbers available if requested but I highly recommend using a board house that accepts Eagle .BRD files. The one I use is E-TekNet. This company is US-based but has its fab facilities in China which enables very low prices. UPDATE: E-TekNet really screwed the pooch on the last job we sent them, leaving many parts off the board and using wrong parts in other places. We no longer recommend them. Bare boards, parts kits and Assembled/Tested converter boards are available from our sister site, Fluxeon.com. Please contact Garret (click on "email Garett" on the left) for more information on the availability and pricing of these products.